The take-off with a paraglider is close to a start with a chair lift and once in flight you are comfortably seated as like as in an armchair. Also people suffering from vertigo can fly with a paraglider; among the people practicing this sport, there is also a significant number of people suffering of this illness and yet they fly at an excellent level. 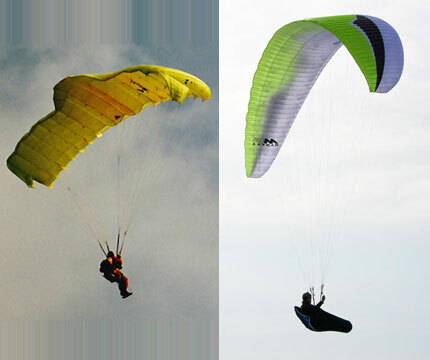 While flying with a paraglider, we do not ‘jump’ as like as a skydiver, but we takeoff as like as an airplane . The takeoff is generally done starting from a gentle slope after checking that the sail is properly inflated; if something is not in place, it’s not a problem, the pilot can always stop the takeoff run before the detach from the ground and stop the glider (stall); once solved the problem the pilot will repeat again all the due control’s procedure for a new takeoff. When you lean out from a balcony do you suffer from vertigo? because there are no fixed points of reference! Once airborne, the only noise will be the wind’s whistle in the glider’s lines. Flying a paraglider doesn’t require an athletic fitness, but good mind concentration ability and mental and physical equilibrium. The touristic paragliding sport, cannot be pertained among the extreme disciplines, but it could be defined “the most extreme sport after chess” because it requires from the pilot the capability to think and to control his emotions. The pilot’s stereotype is neither Rambo nor Lara Croft the TOMB RAIDER’s heroine. Among the best pilots there are mountaineers and skydivers, but also pharmacists, banking, and metal workers, many of whom are happily married with children. The landing with the paraglider is very soft. Most of the time, the landing speed can be compared to a jump from a little step, sometime it is like standing up from a chair. And, if there is no front wind while the landing, it will be sufficient to make a few running steps to dispose of the residual velocity. When is it possible to fly? To fly with a paraglider it is not necessary to have wind, it is possible to takeoff even with zero breeze. The flight can last even some hours using the updrafts of warm air (thermals); a thermal can lift the glider, however, is always the pilot to decide, at any time, where to go and when to go to the landing. In a day of good thermal activity it is easy to see a lot of paragliders turning very tight in the same area as like as mosquitos, in that place there is certainly a ‘thermal’. It is possible to fly all year round, and every season has its own charm, you will never find two days with the same flight’s conditions. 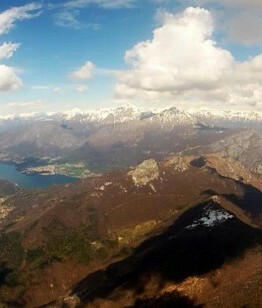 This means that we do not ever get tired of paragliding. The best flyable days for paragliding are in the spring season, with a bit of meteorological instability, with some white fluffy clouds (cumulus) in the sky. 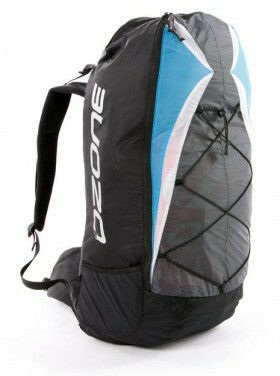 It is possible to fly with only 4 kg of complete paragliding equipment, in about the size of a shoe’s box. All the flight equipment can be stored in a comfortable rucksack that can weight from 4 to 25 kg depending on the type of equipment. The fundamental tools for flying are three: the paraglider (also called wing), the harness, and the helmet. Then follows the reserve parachute, a basic accessory for the achievement of maximum security (it is not compulsory but, as commonly said: “never miss it but never be forced to use it). The harness is essential for the flight, the pilot flies seated on a comfortable seat that is designed to help to control the glider with the movements of the body together with the brakes. The pilot is restrained in the harness with belts, and once locked it is not possible to get out from the harness. Before taking off, as standard procedure, the pilot checks accurately that the buckles are correctly fastened. The current wings are 10 times more performing and 100 time safer! 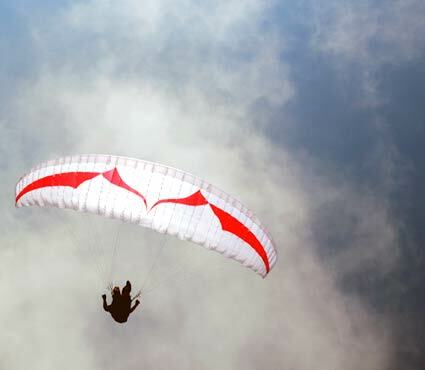 From its inception paragliding has evolved in a radical way; the first paragliders had a mattress shape, as they were coming from the first eight cell parachute, nowadays they have a very slender shape, and are real flying machines. For a not expert can be difficult to distinguish a paraglider from another, but as for sports cars, the more his sickle shape will be ‘sharp and narrow, the more the sail will have better flight characteristics and will require greater airmanship. Paragliders are not all alike, but there are different categories: BASIC (a school glider), INTERMEDIATE, and COMPETITION. The pilot will chose the glider considering his own experience: it is absolutely unacceptable that a low experience pilot would fly with an intermediate glider, only a gradual growth will take him to acquire the ability to fly with more performing gliders. Resta sempre aggiornato su novità e offerte della scuola!